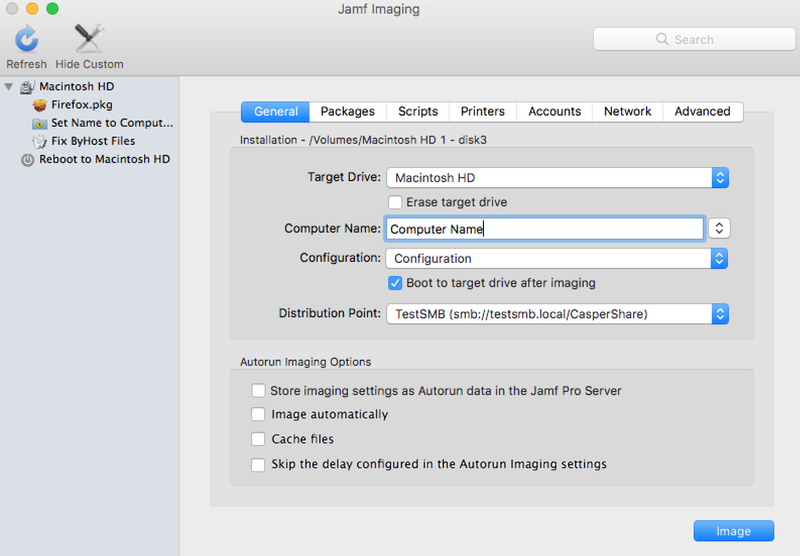 To use Autorun imaging, you need to create Autorun data for each target computer and then run Jamf Imaging on the computers to image them. Creating Autorun data allows you to configure and store the imaging settings you want to use to image each computer. When you open Jamf Imaging on a target computer, Jamf Imaging is populated with the Autorun data. You can configure Autorun data to start the imaging process automatically each time Jamf Imaging is opened on a computer. Otherwise, you need to start the imaging process manually by clicking the Image button in Jamf Imaging. You can also bypass Autorun imaging to prevent Jamf Imaging from being populated with the Autorun data. For instructions, see Simple Computer Searches or Advanced Computer Searches . Click the computer you want to create Autorun data for. If you performed a simple search for an item other than computers, you must click Expand next to an item name to view the computers related to that item. Use the Install payload to configure basic imaging settings for the computer, including the target drive, the configuration to image with, and the distribution point to download files from. Enter credentials for a local account to bypass the prompt when Jamf Imaging is opened on the computer. This is required if you plan to fully automate the imaging process. To cache a copy of each file used for imaging, select the Cache Files checkbox. To skip the delay that occurs before the imaging process starts automatically, select the Skip the delay that occurs before imaging automatically checkbox. You can change this delay by using the Autorun Imaging settings. For more information, see Autorun Imaging Settings. (Optional) Use the rest of the payloads to customize the imaging process. For an overview of each payload, see Customizing the Imaging Process. On the target computer, boot to a startup disk other than the target drive and open Jamf Imaging. (Optional) Configure or make changes to the basic imaging settings as needed, including the target drive, the configuration to image with, and the distribution point to download files from. In the Autorun Imaging Options group box, select the Store imaging settings as Autorun data checkbox. To start the imaging process automatically each time Jamf Imaging is opened on the computer, select the Image Automatically checkbox. You can change this delay by using the Autorun Imaging settings in Jamf Pro. For more information, see Autorun Imaging Settings. 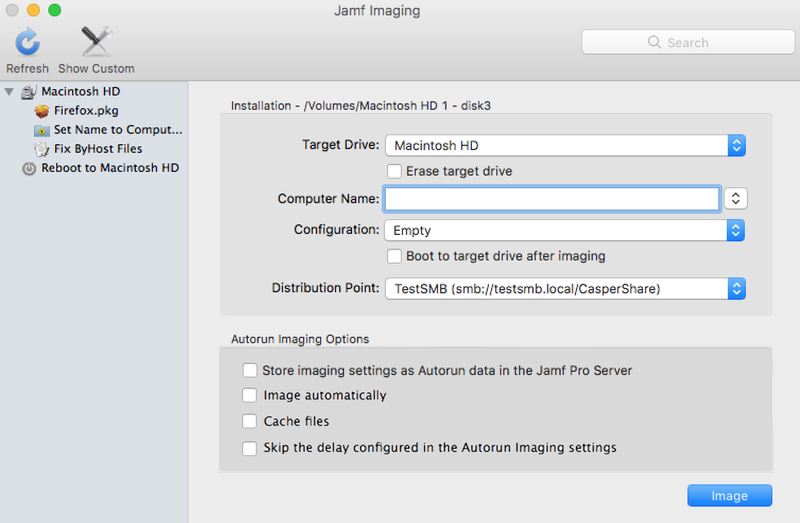 The Autorun data is stored in Jamf Pro when the imaging process is complete. If you configured the Autorun data to start the imaging process automatically, simply boot the target computer to a startup disk other than the target drive and open Jamf Imaging. The imaging process begins after the specified delay. (Optional) Make changes to the basic imaging settings as needed, including the target drive, the configuration to image with, and the distribution point to download files from. (Optional) Use the options in the Autorun Imaging Options group box to change Autorun imaging options for the computer. To bypass Autorun imaging when imaging a computer, hold down the Shift key when you open Jamf Imaging. Click the computer you want to view Autorun logs for. A list of imaging events is displayed. To view the actions that took place during an imaging event, click Show for the event. Find out to configure the settings for Autorun imaging. Find out how to add packages to a computer’s Autorun data when installing packages. Find out how to add packages to a computer’s Autorun data when caching packages. Find out how to add packages to a computer’s Autorun data when installing a cached package. Find out how to mass edit or delete Autorun data for computers.